My Love for Seasoned Vegan – Happy. Homeschooling. Housewife. On the corner of 113th St. and St. Nicholas in Harlem, NY is a restaurant that every person who appreciates delicious, unpretentious cuisine should visit. Wow, I just left the restaurant and already my taste buds are craving to go back! The restaurant has a very warm and relaxed vibe to it. 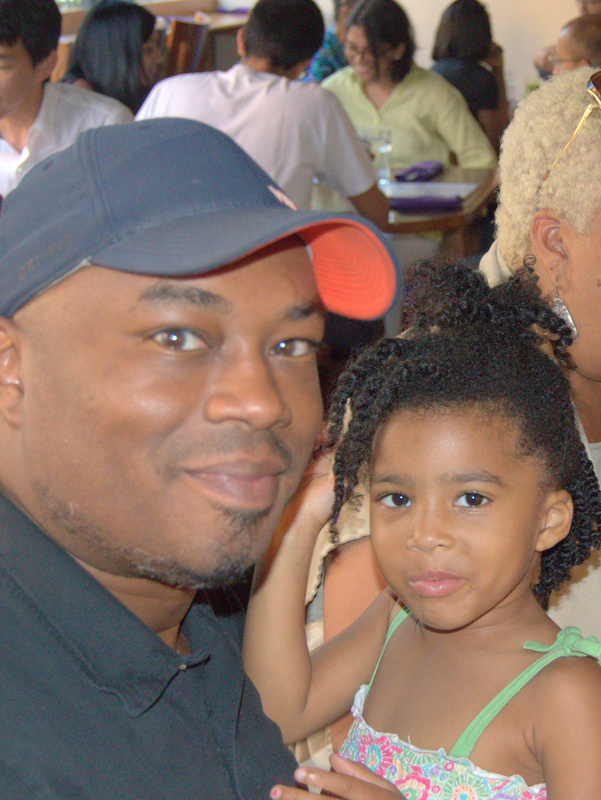 When I walked in I did a secret mommy exhale (you parents know what I am talking about—the exhale that comes when you discover that the restaurant you’ve been invited to with your little ones is not filled with crystal vases and fine white linens). Instead, we walked into a cozy and inviting space, with wooden tables and benches adorned with colorful plush pillows. Right away I knew this was going to be a great place for the Grant family. 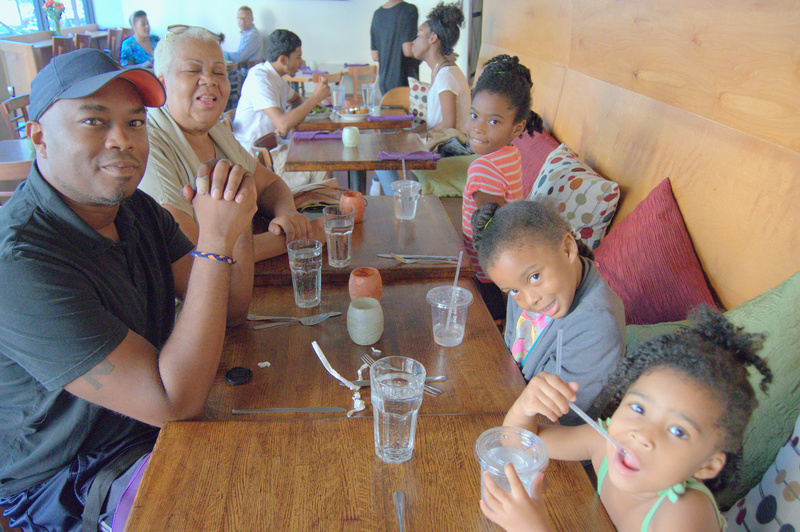 Family pic before our food. 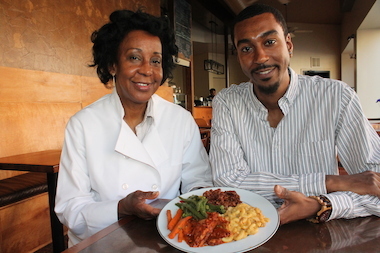 Seasoned Vegan is a family business owned and operated by mother and son team, Brenda and Aaron Beener (featured in the picture below). 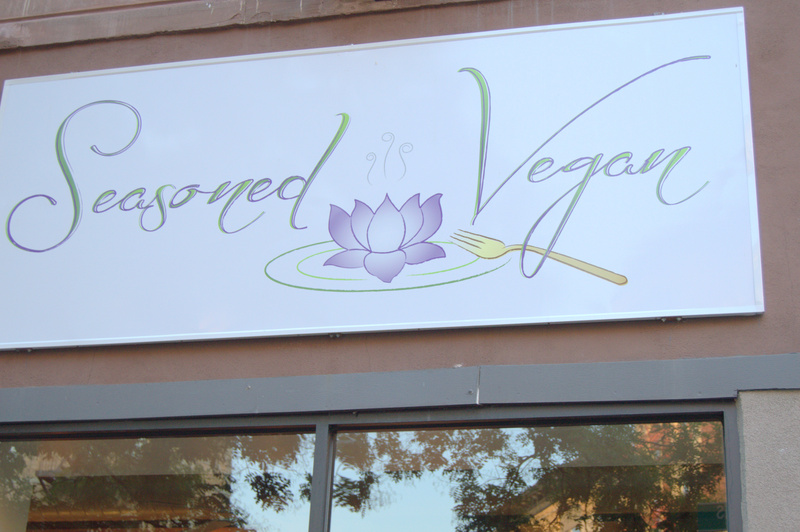 They specialize in preparing gourmet vegan food seasoned with love. When you take a bite you can taste the love! In addition to traditional ‘soul food’ they also offer typical Italian, Asian, Middle Eastern, Caribbean and American dishes all with a soulfully lovely twist. We were seated quickly and given the menu which was straight forward, well organized, and filled with a little something for everyone! Khari and I were overwhelmed with all the choices. Can we really eat everything on the menu? So often when we go out we are limited to french fries, salad (no dressing) and veggie burgers (hold the cheese). Not tonight! We had options for every course of our meal. Khari and Lourdes, two very satisfied Grants!! Their appetizers include Pizza Quesadillas, Homemade Hummus and “Tuna” Roll. 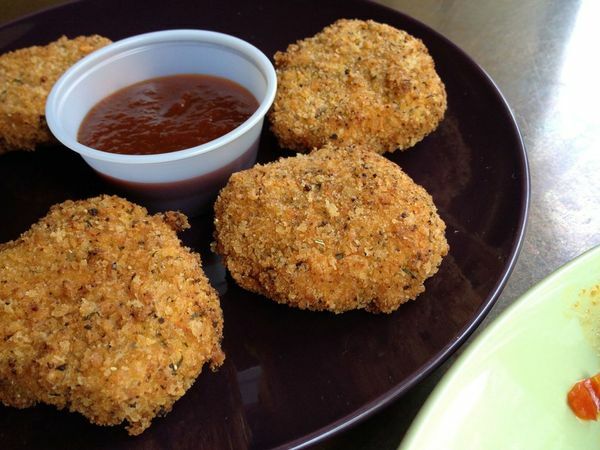 It also features Lemon Crusted “Chicken” Nuggets with Jiggy BBQ Sauce and Uptown Tangy Sauce. The nuggets were the first thing my mother-in-law ordered. She said we had to try them. She was right. I think that was the best advice she has ever given us. Just look at those nuggets! Crispy and so flavorful! They also serve burgers, BBQ “Crawfish”, and a variety of wraps and entrees. But wait, that’s not all. 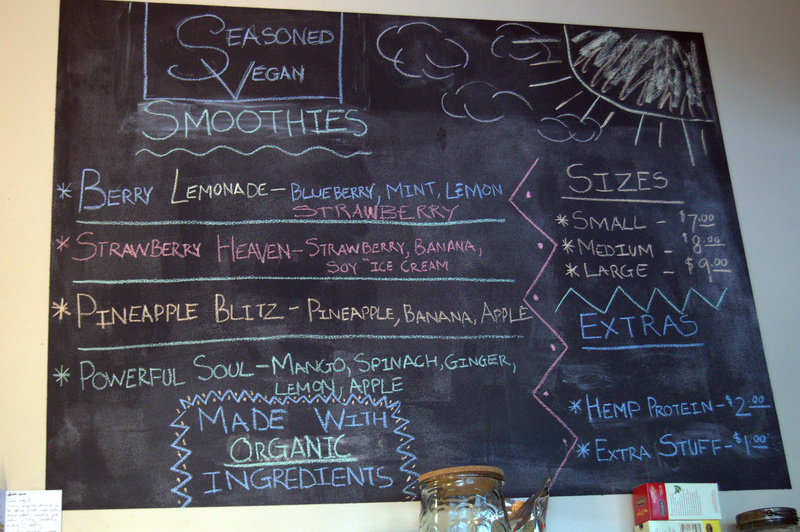 The menu also includes Raw Appetizers, Raw Entrees, Smoothies and Desserts. Really? Really. All organic. All 110% vegan. All delicious. I ordered the smothered “chicken” with a side of sweet potato souffle and mac –n-cheese. Unfortunately for my family, my fork did not stay on my plate. I also sampled the “chicken” nuggets, french fries (they serve the curly ones I love so much) and some of Lela’s “Tuna” melt. 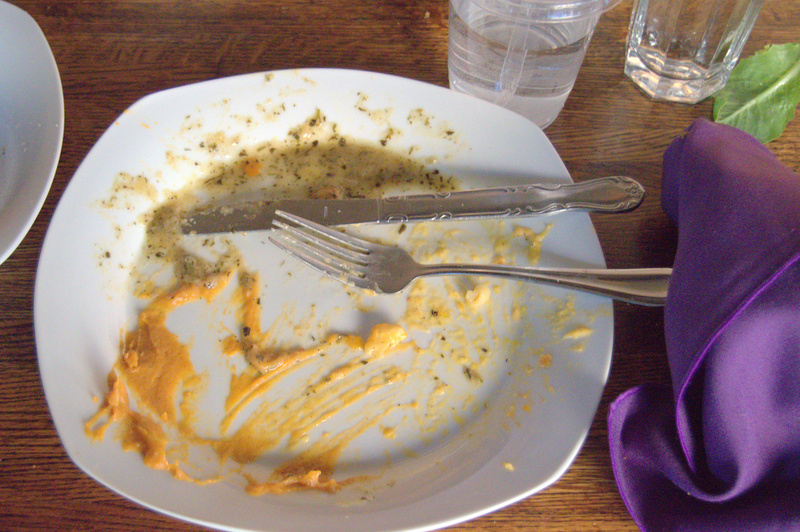 I was planning on taking a picture of my plate before I ate. Seriously it looked and tasted so good…well… sorry ya’ll, this is all you get. It took all my good home training to not lick this plate clean! All delicious and seasoned to perfection. Most of our dinner conversation was centered around trying to figure out how they made the mock tuna fish actually taste like tuna. Seriously, just look at this—amazing! 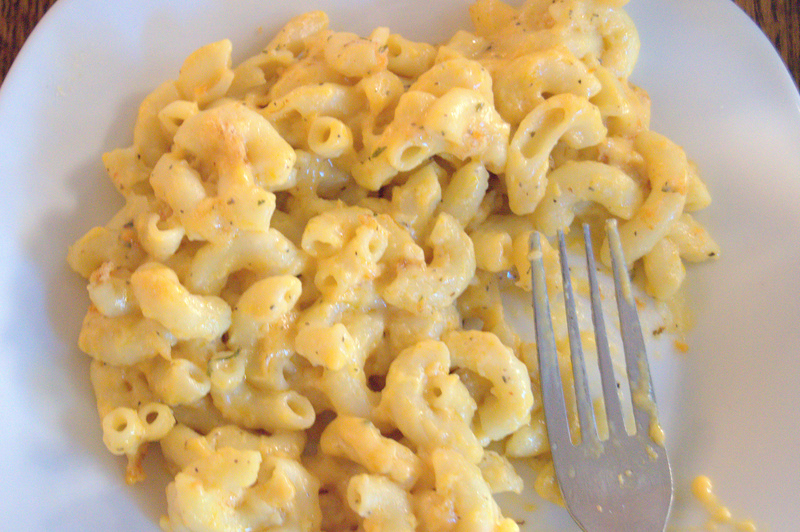 The mac-n-cheese, well—there really are no words for me to describe how utterly incredible the mac-n-cheese is (and I am a mac-n-cheese gal). As I was eating I kept asking, how? Seriously, the food was so good that I had to go and thank someone! I found the perfect people to thank. 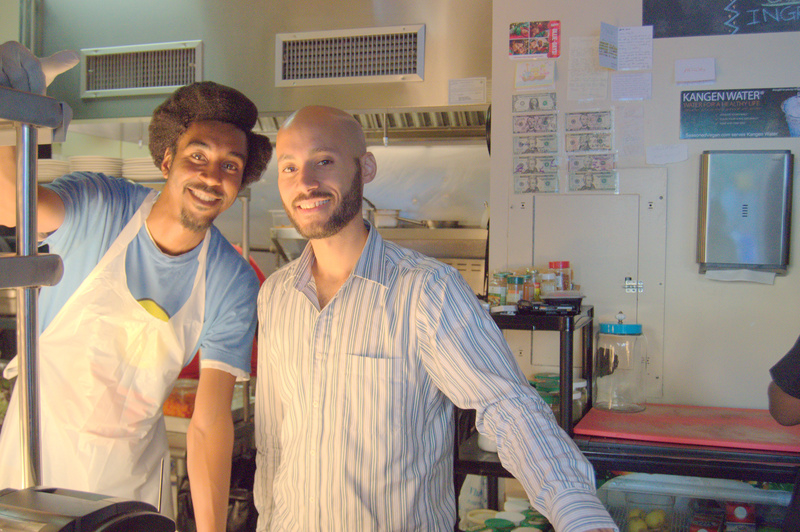 In addition to the warm atmosphere and incredible food is a friendly staff. My girls were just as excited to peak into the kitchen and share all they have been learning about food. Lela told Pascal that she doesn’t like to eat at McDonalds since watching Food Inc. Niara thanked him for not putting chemicals in her food. From the mouths of babes! Aaron and Pascal were both so friendly and patient with all of our questions—they made the restaurant feel like home, which to me is the ultimate compliment. Pascal with the my girls! 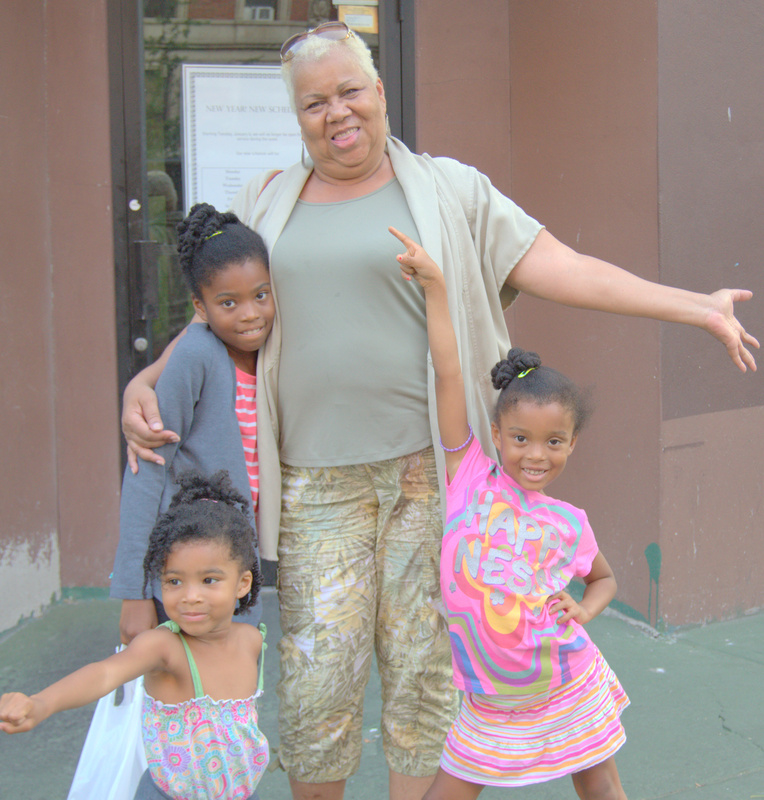 Left to Right: Lourdes, Lela, Pascal, and Niara. We will be headed back home Sunday but best believe that I will be dropping by before hitting the road, the Salted Pecan Chocolate Chip Cookie has my name written all over it! 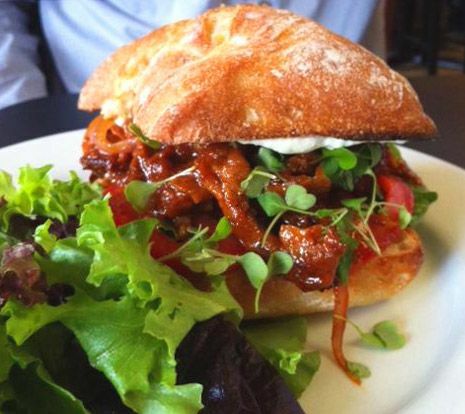 If you can please visit this restaurant—vegan or not! Here’s to Seasoned Vegan! 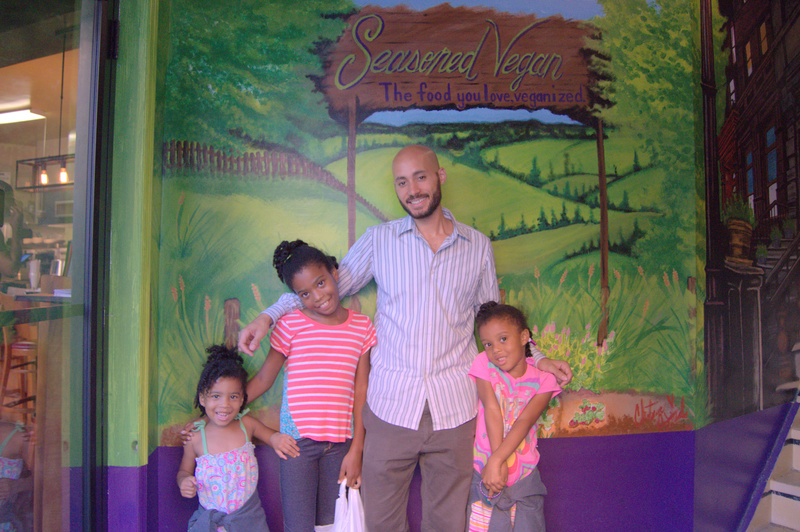 Thanks so making this trip to NY sweeter and thanks for encouraging us all in our vegan journey. Thanks Nana for introducing us! We will see you every time! Look at those happy tummy gals!